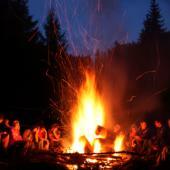 Imagine a space, a hearth, a fire. Imagine an audience hushed and waiting, expectant faces reflecting the firelight that picks out the pillars of a long wooden hall. Imagine a young woman stepping into the light, a girl of fifteen who, three days earlier, could hardly summon the courage to speak her own name. The audience leans forward, the fire shifts and settles, and as if it were the most natural thing in the world, the girl considers her audience. Finally, she speaks. “Once upon a time” …. 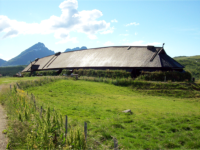 magine….. A village of authentic buildings: a Viking longhouse, Celtic roundhouses, a Saxon hall. A great turf-covered tumulus with an imposing stone entrance which opens to reveal, not a tomb, but a full-sized wooden amphitheatre – the country’s very first purpose-built auditorium for spoken poetry. Such a centre will transform the Cinderella arts of the spoken word. It will focus on the very best in storytelling, poetry, talks, acapella singing and public discourse. It will show people across the UK what is possible in live performance while saving our endangered spoken heritage – our vanishing accents and dialects as well as our skills of memory and delivery. We realize that it is not enough to build a shrine, or museum. We need to put story and poetry to work in the community. We are extending our outreach arm to ensure that the oral tradition serves and liberates those who need it the most. Working with those who need help, we’ve begun to make a difference to increasing numbers of people. We will also be creating a national archive of story, comedy, talks and debate; preserving accents and dialects and oral histories, the very sinews of our vanishing oral culture.